The first two titles are RAID 1 Rangers Lead the Way - Pointe-du-Hoc D-Day 1944 and RAID 2 Israel\'s Lightning Strike - The raid on Entebbe 1976. Pointe-du-Hoc is obviously one of the classic wartime raids and the author Steven Zaloga has done an excellent job at recreating not only the drama of the raid itself but also provides a careful analysis of the successes and failures of both Allied intelligence and the Allied bombing attacks prior to the raid itself. The story of the raid on Entebbe has always fascinated me, ever since watching the classic Charles Bronson film Raid on Entebbe as a child. For those of you who also remember watching this, its worth pointing out that Bronson was 55 when he played the role of Brigadier General Dan Shomron while incredibly Shomron himself was just 38 when he planned and executed one of the most daring hostage rescue attempts the world has ever seen. I know i should say this anyway but i have just finished reading Entebbe and it is very good. You get a real sense of the unfolding events and the incredible risks they Israelis took to get their people home. It was a really good read. Wow, looks amazing. 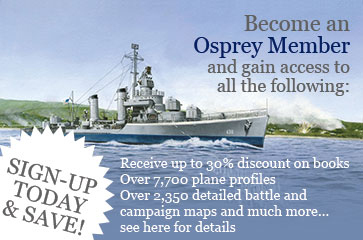 Good job Osprey!